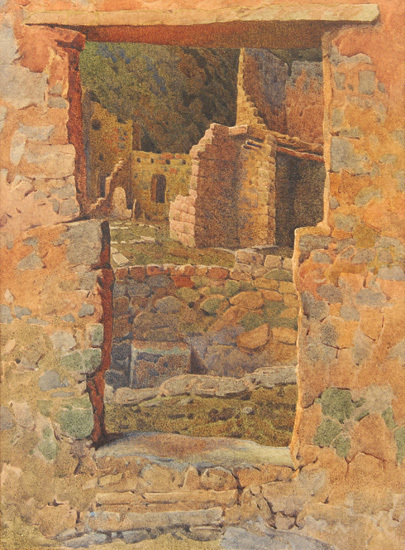 Floyd Hopper, Ruins, Watercolor, Eckert & Ross Fine Art. Click to inquire. The month of August is notoriously languid. The unofficial month of the shut down, August inspires this post’s focus on the depiction of architectural break downs. Ruins-particularly ancient structures-have always factored metaphorically in canvases. Religious imagery in Renaissance canvases often incorporated Greco-Roman ruins as symbolism for the triumph of Catholicism over paganism. Alfred Wands, Untitled, Oil on board, David Cook Galleries. Click to inquire. 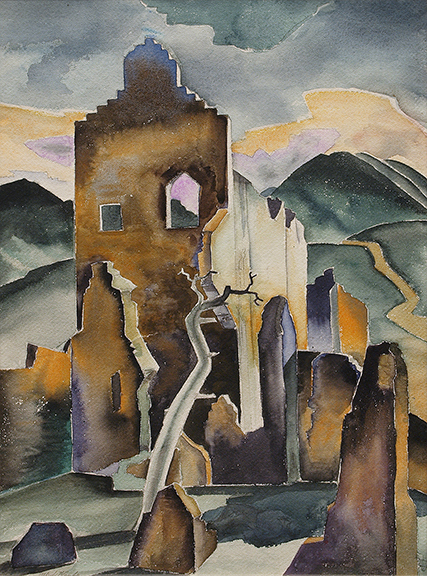 Gunnar Widforss, Ruins (Mesa Verde, New Mexico), c. 1923, Watercolor, George Stern Fine Arts. Click to inquire. 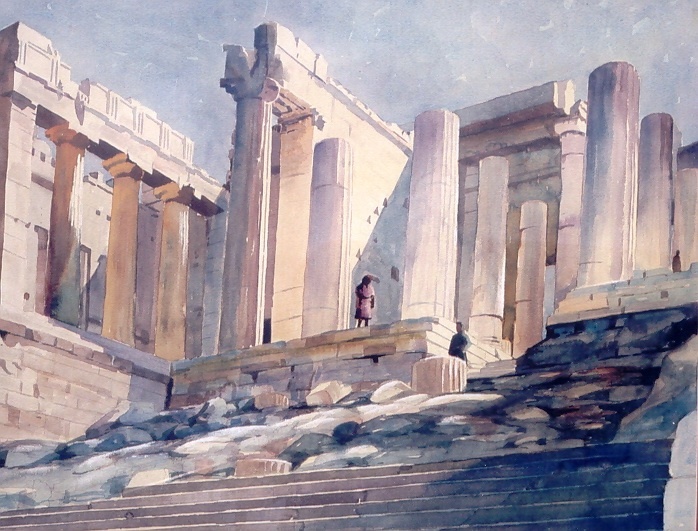 Today, there is a reverence for ancient ruins, seen in Floyd Hopper’s Ruins, in the inventory of Member Gallery Eckert & Ross Fine Art, a watercolor of Athen’s acropolis. Preservation projects seek to maintain ruins, and artworks of famous ruins perpetuate the visual and cultural history of sites. Perhaps this makes it more jarring to see ruins of contemporary buildings in cities. 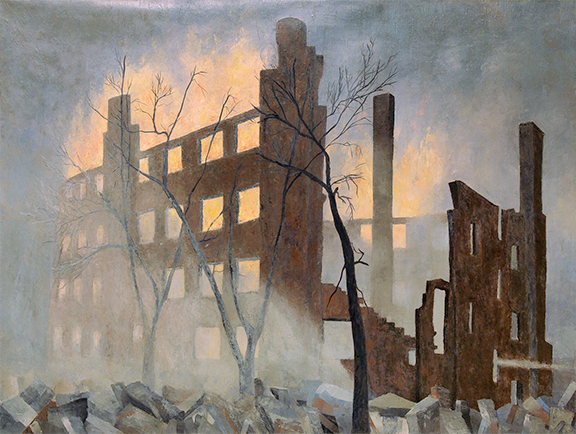 Edward S. Goldman, Ruins (Chicago), Acrylic on canvas, David Cook Galleries. Click to inquire. Simon Procter, Chanel,The Broken Cinema, Haute Couture, Paris Grand Palais, C-Print, Rosenbaum Contemporary. Click to inquire. How do pictorial attitudes differ in depicting the ruins of each century. What artistic allure do ruins emanate? Simon Procter’s photograph of Chanel’s 2013 Haute Couture show, in the inventory of Member Gallery Rosenbaum Contemporary, highlights how the lure of ruins has surpassed documentary and artistic renderings-now a set design to enhance the design house’s latest looks.